Oh, my word! I don’t have enough words to say how unbelievably incredible this book is. I literally started this book and devoured it in one go, that first page hooked me right up until the last very last word. I am a huge fan of Ms Matthews, her writing is always flawless and articulate, but this simply is in a league of its own. Lady Helena Reynolds is running away from London, running away from something worse than death. She answers a Matrimonial Advertisement in the paper, gets on a train and travels to Devon to marry a man she has never met. She is desperate, this really is the only way she can protect herself. The man himself and her soon to be home isn’t exactly what she expected, he isn’t exactly the knight on a white horse with a fairy tale castle on a hill, he is just as vulnerable and tormented as her. Helena is a scared, desperate young woman who is facing something that no woman should have to face. She has been treated absolutely abysmally by her powerful uncle and his cronies and now she is running not just her life, but her sanity. My heart bleeds for Helena, especially when all she wants out of her marriage is for Justin to be kind to her, she is a good person who has been through so much. Ms Matthews has created an incredible young woman, her fear and desperation is palpable in every scene she is in. Yet deep down there is a strong woman who just wants to be free of her fear, she wants to be happy. Justin is the perfect man for her, he is protective to a fault, kind and honourable, he opens her eyes to exactly the kind of woman she wishes to be. Self-made man and Ex-military Captain; Justin Thornhill is reluctantly in search of a wife, not something he is looking forward to. But as his man-of-business took it upon himself to put an advertisement in the paper for a bride, he knows that if he is ever going to gain the trust and civility of the villager’s instead of constant disdain towards him, he needs a wife to help him. He expects an older stern woman who will be able to manage a house and servants, what he doesn’t expect is a young beautiful woman, who is terrified and secretive. Oh, my goodness! What a man Justin is, he is a brilliantly good man. Always putting others first, he never thinks of himself and when he does it is only to think of what a horrible man he is – which is a complete lie. He think’s himself to be too much of a monster for anyone to love, especially the likes of fragile Helena. But, he is an incredible, brilliantly handsome, tormented kind man who is highly protective to those he loves, ruthless in business and principled. Both go into this ‘Marriage of Convenience’ with one purpose in mind, that this arrangement will benefit them both, him for the wife that he clearly needs and her for the protection she desperately needs. As each of their personal secrets are revealed, they soon learn that this arrangement is something more than either of them had expected. I love how they start bonding and getting to know each other over the likes of Charles Dickens, it brings a great realism to their relationship. This isn’t just a tender and loving romance as there are some very sensitive and difficult subjects that are a vital part of the whole story. Such as asylums and the Indian revolutions, these are tough and heartbreaking subjects and the scenes are full of angst and emotion. When Justin and Helena finally reveal their past’s, which involve those subjects those scenes are raw and heart-wrenching. Ms Matthews has done an astounding job at covering these hard and difficult subject’s, and she has conveyed the subject with realism and respectful clarity. Anyone who has read my reviews, will know how much I love this lady’s work. I am a massive fan of Mimi Matthews she is my go to author for anything Victorian, her brilliantly composed and stylish writing engages and entrances. 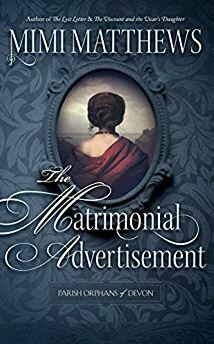 ‘The Matrimonial Advertisement’ is a lot darker that what we have come to expect from Ms Matthews, but for me this is Gothic Victorian story-telling at its best. This is how this genre is supposed to be written! The plot is solid and fresh it takes you on a journey that will have you reaching for the tissues, I can guarantee that you will be weeping like a baby. The characters are astounding, they develop throughout the story in a natural and wonderful way, not just as people but as their romance blossoms so beautifully. Ms Matthews has out done herself with this, by far one of the best books I have read -ever! I cannot wait to see what comes next in the series, I am hoping that Justin’s best friends and fellow orphans; adorable Neville and Cunning Tom get a story. This is a hauntingly beautiful, gripping and heart-wrenching story. The Matrimonial Advertisement is to be released on 4th September and can be pre-ordered at Amazon. This entry was posted in ARC, Historical Romance, Reviews, Victorian Romance and tagged ARC, Historical Romance, Mimi Matthews, Parish Orphans of Devon Series, Review, The Matrimonial Advertisement, Victorian Romance. Mimi kindly sent an ARC and it is now on my priority reading list.